These breathing exercises feature "anywhere, anytime" techniques, are free and easy, and can improve your well-being right now. Breathing exercises can create a sense of calm while reducing stress and even lowering your blood pressure. Relax and take a deep breath. It’s a common recommendation from physicians and friends who seek to help you reach a state of calm when you’re feeling frazzled. Breathing is an essential and automatic function. But with deliberate focus on breathing, it’s a proven tool for healing and well-being. With breathing exercises, mere minutes of conscious breathing can help you feel better and think more clearly. Deep breathing can quickly help you feel calmer. Breathing techniques vary, but some can be done anywhere, anytime. Don’t force it; alternate your regular breaths with suggested techniques. 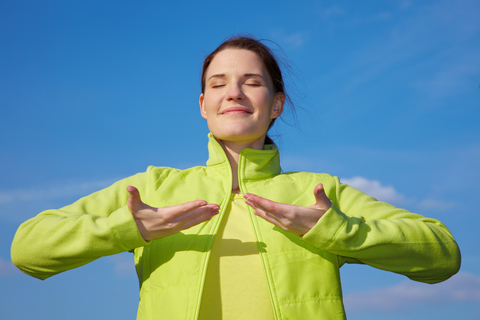 Mind-body practices such as yoga, tai chi, and qigong usually include deep breathing. Full-belly breaths stimulate the vagus nerve, which releases natural calming chemicals. Conscious breathing can literally change your physiological state. When you’re stressed out, the heart rate increases and the breathing tends to get very shallow. Blood pressure can also rise and, depending on the circumstance, that stress can thrust you into fight, flight, or freeze mode. But, you can reverse all that with slow, deep breaths. The calming action of such deliberate breathing activates the parasympathetic nervous system. Sometimes referred to as the “rest and digest” system, the parasympathetic nervous system slows heart rate and helps bring equilibrium to the body. Quite simply, deep breathing calms you down. That’s why it’s an integral part of many yoga, tai chi, and meditation classes. You don’t need a formal or lengthy practice. Try one of these easy breathing exercises next time you feel stress begin to rise. Those who feel anxious may become moreso when instructed with the overly meticulous breathing exercises. This conscious breathing exercise blends current-state breathing with a few longer inhales and exhales in between. This approach helps you to accept where you are and to ease into the breathing exercise. It leads to a relaxed yet alert state of mind. Exhale to a count of six. Allow several normal breath cycles to complete, then again focus on exhaling to a count of six. Let the breaths be smooth and feel the body relaxing. Switch your focus by inhaling to a six-count. Again, allow your body to breathe in and out naturally several times. Focus on the six-count inhalation every few breaths. Combine these by inhaling for six and exhaling for six. There’s no need for every breath in and out to be a six-count. But eventually, the idea is to piece together this rhythm without force. Allow your body to ease into it. Deep breathing stimulates the vagus nerve, the longest cranial nerve. This nerve extends from the brain and branches into and influences numerous vital organs. When stimulated through techniques like deep breathing, the vagus nerve triggers the release of various chemicals that can induce calm throughout the body. Researchers have been studying how electronically stimulating the vagus nerve might treat a variety of conditions, including epilepsy, depression, asthma, stroke, migraines, and inflammatory diseases. This technique is an efficient and effective mindfulness method to create a pause or shift in the middle of the day. Try doing it for a minute after a stressful encounter or before talking with a loved one who is under pressure. The acronym guides the practice. S: Stop or slow down what you are doing. T: Take a few deep, slow breaths. With each inhale invite calm, with each exhale release negative thoughts or emotions. O: Observe how you are feeling in your body as breath slowly. Notice thoughts and emotions and invite calm. P: Proceed with what you were doing. Perfection isn’t the goal of any of these practices. People who are overly stressed or have anxiety may try too hard to “do it right.” It’s not about doing it right or trying hard to control breath. The practices are meant to be gentle and unforced. Breathing exercises can be done anywhere: in the car, while exercising, gardening, or walking the dog. Simply connecting the body and mind with the breath can calm down your nervous system. Through time, this kind of attention can help decrease blood pressure as well as reduce other ill effects of stress, including headaches, digestive issues, and depression. anxiety, asthma, blood pressure, brain, breathing exercise, breathing exercises, depression, digestive, Digestive Issues, effects of stress, exercise, headaches, meditation, migraines, mindfulness, stress, stressed out, stroke, vagus nerve.